If the first piece is any indication, it’ll be a good one. Respected defense reporter David Wood focuses on Cpl. Tyler Southern, who was an infantryman with 1st Battalion, 2nd Marines, on May 5, 2010, when his body was rocked by an improvised explosive device in Now Zad district. Southern was nearly killed and lost both legs and his right arm — but he has endured. Southern’s assessment of his current life is remarkable. “If anything, this would be Chapter 2,” he said. “This is page one of Chapter 2. You know, I did my adolesence and my childhood, and now I just got married recently. 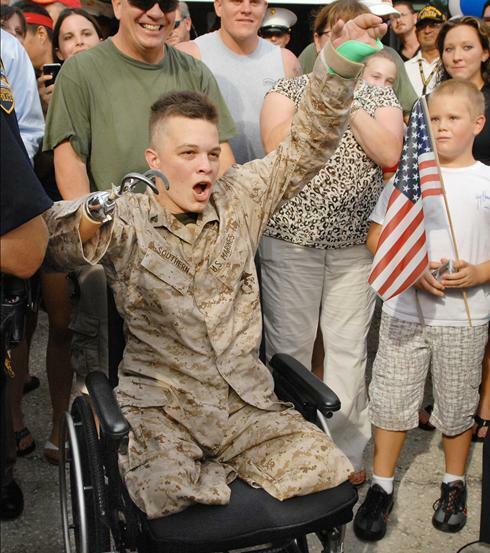 God bless this brave soldier and may God be with him during time of healing. This truly touched my heart and he is in my prayers. Ooh-Rah MARINE! God bless him! Bless you and your family…may your spirit shine brightly so that it will be the beacon of light for all wound warriors…Thank you.